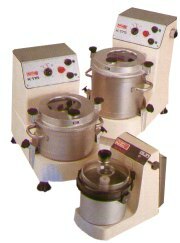 A full range of food processors from low volume to full industrial mixers. K55/K115/K175 Food processors available in 5.5, 11.5 or 17.5 litre capacities. K55 has forward and pulse speed controls. K115 and K175 have choice of two forward speeds and pulse control and are fitted with timers.